Redhot, aka Redhot Hipockets, is a beautiful, 7-year-old white female, with a brindle patch over her left eye, born December 7, 2001. Her sire is Grenade, making her grand sire the famous Molotov, and her dam is Sassy Kelli. Redhot and Rubydo are siblings and seem to have been together for some time. Both girls were turned in together to the Altus Animal Shelter, and they were scheduled for euthanasia within 3 hours of their coming into GALT's custody. The person turning them in said he could no longer care for them. 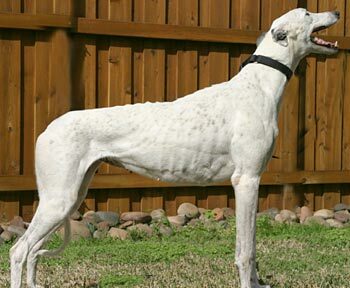 Greyhound-data shows 62 races to Redhot's credit, starting in Lincoln Park, RI, on August 13, 2003, and ending at Victoryland in Shorter, AL, on October 28, 2005. 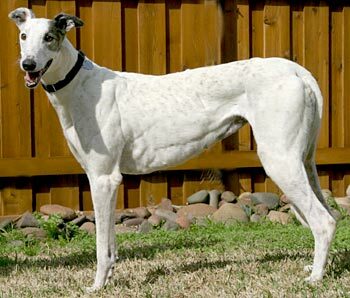 She has seven registered offspring born on March 22, 2007, sired by Boone's Fishnkid. Her whereabouts since then are unknown. 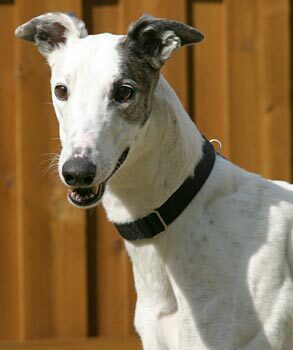 Redhot is a sweet, loving girl who is in a foster home with several other greyhounds. It is not known at this time if Redhot is cat or small animal tolerant.